Hanshaw, Harry, head-of-household, age 53, born in Canada; parents born in Canada; immigrated 1898; first married at age 29; rented home ($38 rent); radio in home; occupation: machinist, railroad; not a war veteran. Hanshaw, Mary, wife, age 40, born in Canada; parents born in Canada; immigrated 1903; first married at age 17. 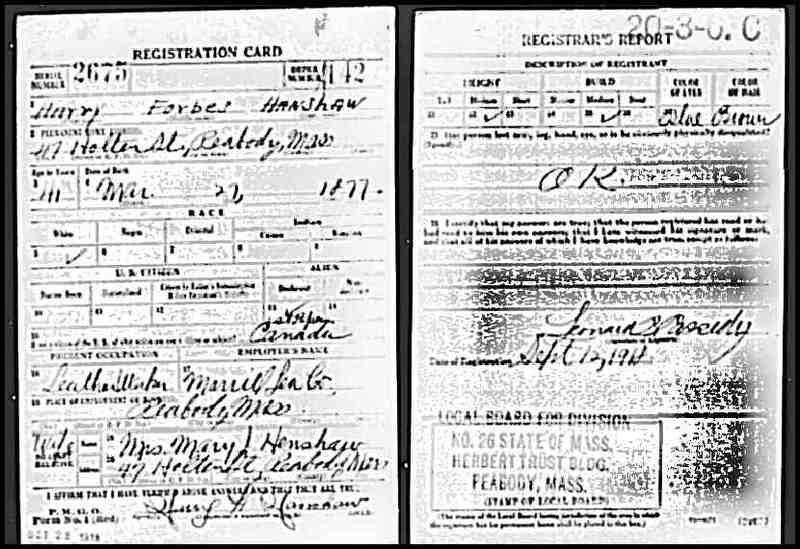 Hanshaw, Howard C., son, age 22, born in Massachusetts; parents born in Canada; attended school; occupation: none; not a war veteran. Walker [?unclear], Allen, father-in-law, age 84, born in Canada; parents born in Canada; immigrated 1927; widower; occupation: none; not a war veteran. 1930 census, 5th Ward, Melrose, Middlesex County, Massachusetts; roll T626-925, ED 346, page 3A, line #7, dwelling #27, family #62. 1881 LDS census index, Hillsburgh, Digby County, Nova Scotia; NA film #C-13172, District 15, Sub-district A, page 31, household #165. "330 Years of Morehouse Genealogy, 1640-1970", by Inez Manzer Sypher Morehouse, 1978; page 482.